All should enter from Bergen Street onto the campus. When on Bergen St., look for the Kentucky Fried Chicken Restaurant. The driveway you will want to turn into is located across the street. Turn into driveway and proceed straight ahead. You will see a large white VALET PARKING sign on the building ahead of you. Drive to/under that sign to valet and park your car. 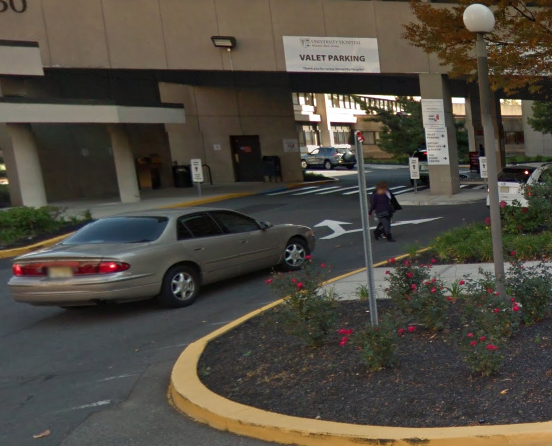 The VALET booth is located on the right just past the MAIN ENTRANCE to the hospital. THE STONE CENTER OF N.J. is located behind the valet booth. There is a parking garage on the campus for your convenience in the event the valet is not available (valet hours of operations are Monday – Friday 7:00 am-7:00 pm). Our weekday patients who arrive before 7:00 am and our Saturday patients must self park in the garage. The garage is to the left of the main entrance of the hospital. Those patients are welcome to have their parking ticket from the parking garage validated at The Stone Center front desk. Click here for a detailed map (PDF). Take Exit 145 to 280 East. Stay in center lane. Take Exit 13, (on the left) Newark, ( First St., Branch Brook Park, Rutgers Health Sciences and NJIT). Turn right onto First St. (First St. becomes Bergen St.) The Entrance to University Hospital will be on your left (after the fourth traffic light). Look for signs for Valet Parking. The Stone Center is located behind the Valet Booth. Take Exit 56/W. Peddie St/Elizabeth Ave. and follow signs for W. Peddie St. The exit ramp for W. Peddie St. is in the far RIGHT lane. At the end of the exit make a left turn onto W. Peddie St. At the second light make a right turn onto Bergen St. Continue on Bergen St. through 13 lights. Turn right into the 2nd entrance to University Hospital. Look for signs for Valet Parking. The Stone Center is located behind the Valet Booth. Take Exit 15W to 280 West to the Orange St/6th St Exit. Make first right onto Orange St., proceed one block and turn right onto First St. (First St. becomes Bergen St.) The entrance to University Hospital (after the fourth traffic light) will be on your left. Look for signs for Valet Parking. The Stone Center is located behind the Valet Booth. Take the George Washington Bridge or the Lincoln Tunnel to the New Jersey Turnpike. Follow directions above. Take the Holland Tunnel to the NJ Turnpike (Exit 14) to Route 78 West, and follow the directions above. PATH and Amtrak rail lines and New Jersey Transit buses and trains serve Penn Station in downtown Newark, about a mile from the Hospital. The #31 and #34 buses stop at the campus. Taxi service is available to and from Penn Station and Newark International Airport.